Greetings from your ‘wood-positive’ news team. Another regional growth plan has been underpinned for forestry as China Forestry Group NZ and Taranakipine sawmill in New Plymouth recently signed a supply agreement today. They are celebrating the fact that it supports long term wood processing in New Plymouth and employment for the 170 workers at Taranakipine. Alongside that announcement last week, Regional Development Minister Shane Jones has confirmed a $1.9 million loan from the Government’s Provincial Growth Fund to Taranakipine. CEO Tom Boon said most of the money will be used to upgrade processing plant technology for producing more value-added engineered timber panels. This week in market news we have the most recent results from the regular Scion Log Price Outlook as well as an update showing the dramatic drop in export log shipments from Australia over the past year. WoodWeek subscribers HOT TIP: Heads up if you have business interests in the Pacific Northwest! 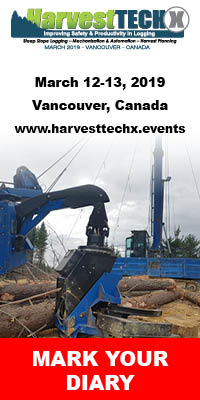 Once again in partnership with the team at Logging & Sawmilling Journal, this we are launching our 3rd HarvestTECHX Conference – running on 12-13 March in Vancouver 2019. The event sold out last time it ran in BC in 2016. See https://harvesttechx.events/ for details. There are a few sponsorship or exhibition stands available too, but they are selling fast. An in-forest workshop on the day after the conference and organised by our event partners at the BC Forest Safety Council is also available to limited numbers of people attending our conference. MBIE has recently released figures that illustrate wood fuel is the cleanest energy consumed for process heat in New Zealand, by a huge margin. The data indicates that replacing fossil fuels with wood energy could drastically reduce greenhouse gas emissions, while it lists electricity as the third largest emitter of GHGs. On that theme it was good to see Fonterra’s Brightwater milk processing plant in Nelson is now co-firing on wood. The site’s newly converted boiler was officially switched on by the Minister of Energy and Resources, Hon Dr Megan Woods late last week. Let’s hope we see more backing for good wood initiatives like this from our political leaders again soon. Finally, a new report shows rural landowners are finally waking up to a weed which covers 1.8 million hectares of the country. Their chainsaws are out, but they’re also supportive of “novel approaches” to managing wilding pines. To highlight the scale of the problem and the need for a comprehensive plan to attack it, Scion researcher Jonathan Dash gave a presentation at our ForestTECH conference last week in Rotorua on how they are using technology to measure and plan a solution to the rapid spread of wilding pines. China Forestry Group NZ and Taranakipine sawmill in New Plymouth have signed a supply agreement today that supports long term wood processing in New Plymouth and employment for the 170 workers at Taranakipine. It’s another initiative that demonstrates China Forestry Group NZ’s ongoing commitment to New Zealand. Australian report on export sawlogs and export pulplogs - Reported total sales* for export sawlogs by volume have decreased by 19 percent while the tonnages for export pulplogs decreased by 33 percent since the previous reporting period. Scion Log Price Outlook - In August, seventy-three people from various parts of New Zealand’s domestic and international forestry products supply chains participated in this outlook. 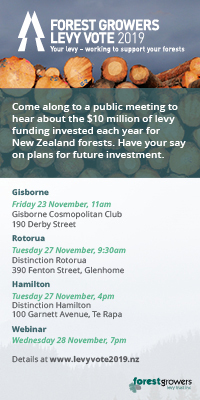 These participants represent a substantial component of the NZ forestry industry. 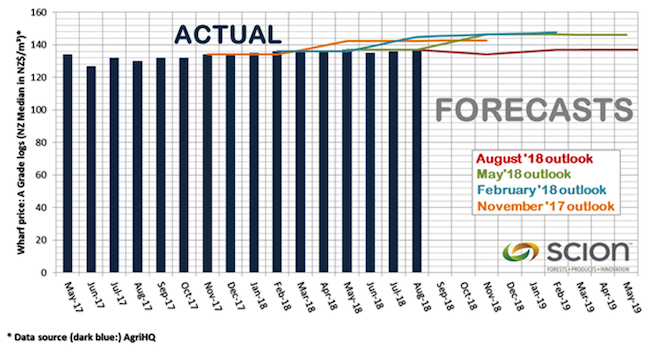 In contrast to the three previous outlooks, longer term log price outlooks remain stable, with no associated expectation of increase after 6-12 months. This may reflect the relative stability seen in the log prices over the past year. Somewhat more participants expect little immediate adverse movements in log prices (the mean is -2%) for the first time in twelve months. The same respondents anticipate a stable future pricing regime and volumes are also expected to be relatively consistent with perhaps a 2% increase in a year time. Most of the respondents and forest growers do not expect any impact of the 1 Billion Trees Policy on their business in this year. China and other export markets are always in the focus of the respondents, however, from a focus on the domestic market and oil prices in May the attention has shifted to the USA-China trade war and the possible consequences. To access previous outlook reports please click here. If you operate a business anywhere along the forestry products supply chain then please consider casting your vote in our November Outlook. All information is treated as confidential and results are reported anonymously and at an aggregated scale only. The Outlook will be shared exclusively with participants in December and will only become available publicly in January. Please participate before Friday 30 November. The invader is not gorse, blackberry or Scottish broom. It’s wilding pines spread by seeds from plantation forests and shelter belts. A growing awareness - In 2015 just 25 percent of landowners were aware of wilding pines in their region, which has now increased to 60 percent. Attitudes to wildings have changed too. The 2015 survey found 22 percent of landowners surveyed thought wildings were more beneficial than harmful, now just 7 percent think they have any benefit. South Island respondents were the most aware of the issue. Federated Farmers North Otago president Simon Williamson said wilding pines were the biggest issue high country faces. While California smoulders, New Zealand researchers are figuring out ways to reduce the fire risk a billion trees pose in a warming world. Farah Hancock reports (for Newsroom). When Tim Curran arrived at Lincoln University from Australia the first piece of equipment he asked for was a barbecue. He wasn’t planning to throw a prawn on it. The barbecue, purpose-built out of a 44- gallon drum, is essential to the ecologist’s research into the flammability of different plants. It’s a low-tech tool to understand a growing risk. Climate change means the number of days where the risk of fire is classed as very high or extreme are expected to increase by 71 percent in New Zealand by 2040. With the One Billion Trees programme adding more fuel to the countryside his work represents the life and death importance of finding the right tree for the right place. All trees will burn, but some burn faster and hotter than others. Curran’s barbecue weeds out the fierce burners. “It would be best if you could burn a whole plant, which is fine if you are dealing with a grass, it’s harder for a shrub and it’s pretty much impossible for a tree,” said Curran. His solution is to burn 70cm shoots in his barbecue. Once on the barbecue, readings are taken measuring how quickly the shoot ignites, how long it burns for and the temperature it burns at. Typically, the more moisture the plant has in its leaves, the less flammable it is. Another factor is how much oil or resin a plant has. The Ministry of Business, Innovation and Employment has released figures which illustrate wood fuel is the cleanest energy consumed for process heat in New Zealand, by a huge margin. The data indicates that replacing fossil fuels with wood energy could drastically reduce greenhouse gas emissions, while it lists electricity as the third largest emitter of GHGs. So why is the government incentivising electricity through capital funding for projects, while wood fuel is not being robustly promoted? In an environment where electrification technology is attracting funding from central government, capital projects for proven biomass technology should also be incentivised. Scion has issued its annual report for the 12 months ending 30 June 2018 presenting a successful year for the Rotorua-based Crown research institute. New board chair Dr Helen Anderson says Scion strongly believe that forestry, and all that can be made from trees, has great potential to enhance New Zealand’s prosperity, wellbeing and environment in very significant ways. “Our purpose is highly aligned with many government objectives, such as increasing afforestation and enabling a zero carbon emissions economy by 2050. Scion is also working with Maori to achieve long-term aspirations. Three Maori partnerships involving Scion were supported by the new Provincial Growth Fund,” said Dr Anderson. A milestone achievement for Scion was completion of the world-first draft assembly of the radiata pine genome, which marked the beginning of a new era of precision forestry for this dominant plantation species. In other work, Scion found that optimising radiata pine stand density could increase the net value of the plantation estate by $1.7 billion. A newly developed model can predict the optimum final crop stand density for producing structural grade timber. The model will be released later in 2018 for use by forest owners and managers to plan targetted operations optimising stand density and maximising the value of their crop. Scion’s launch of the New Zealand Biofuels Roadmap in February by the Minister of Energy and Resources was successful in stimulating discussion on domestic large- scale production and use of liquid biofuels among major industry players and policy makers. Scion reported evenue growth of 9.3 per cent to $56.7 million (budget $54.6 million) provided a net profit after tax of $2.3 million (budget $1.7 million). It positions them well for reinvesting in the construction of an innovation hub and other science and building infrastructure. “We made great progress during the year on our plans for an innovation hub in the heart of the campus, and we also refurbished dated office areas,” said Chief Executive Dr Julian Elder. The detailed design for the innovation hub was completed. Construction is set to start in a few months. The innovation hub will be the new entry point to Scion and will include a public cafe and exhibition area. Co-Firing on all cylinders: Fonterra Brightwater Site to Reduce Emissions by 25 Percent - Fonterra’s Brightwater milk processing plant in Nelson is now co- firing on wood after the site’s newly converted boiler was officially switched on by the Minister of Energy and Resources, Hon Dr Megan Woods earlier this week. The conversion slashes the amount of coal used and cuts carbon emissions at the site by around 2,400 tonnes a year – roughly the same as taking 530 (internal combustion) cars off the road. Thanks to support from the Energy Efficiency and Conservation Authority (EECA), Fonterra has achieved a significant step in the Road Map to Transition to a Low Emissions Future, developed with the Ministry for the Environment last year. Mr Spurway says curtailing emissions requires a multi-faceted approach. EECA CEO Andrew Caseley says that this project demonstrates how co-firing can be used now to reduce energy emissions for process heat. This had better be ... a laughing matter! A man was standing outside his house telling his neighbor his news: "I just bought a new hearing aid. It cost me six thousand dollars, but it's state of the art." Two small county judges both got arrested for speeding on the same day. Rather than call the state Supreme Court for a visiting judge, each agreed to hear the other's case. The first judge took the bench while the second stood at the defendant's table, and admitted his guilt. The sentencing judge immediately suspended both the fine and costs. They switched places. The second judge admitted that he was speeding, too. There upon the first judge immediately fined him $250 and ordered him to pay court costs. The second judge was furious. "I suspended your fine and costs, but you threw the book at me!" he fumed. The first judge looked at him and replied, "This is the second such case we've had in here today. Someone has to get tough about all this speeding!" A homeowner was delighted with the way the painter had done all the work on his house. "You did a great job." he said and handed the man a cheque. "Also, as a bonus, here's an extra $100 to take the missus out to dinner and a movie." Later that night, the doorbell rang and it was the painter. "What's the matter," asked the homeowner, "did you forget something?"